Sgt. Magiaccomo of the Warwick Police Department describing improvements at Salter Grove to local residents. 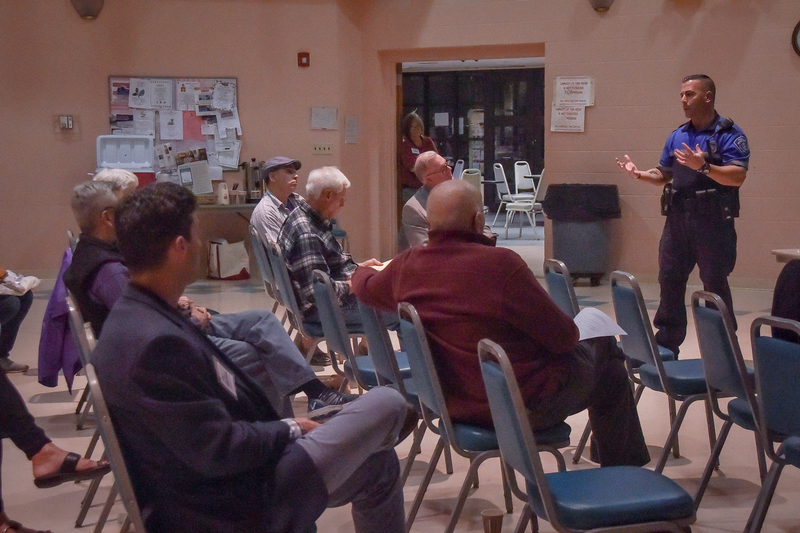 Join us for a meeting at the Pilgrim Senior Center (27 Pilgrim Pkwy in Warwick) on Thursday, October 26th at 7:00 p.m. to learn about advances made at Salter Grove since our first neighborhood meeting on April 13th. We’ve enjoyed two potlucks at the park with beautiful weather and great food in the company of neighbors who value this great backyard we have in common. Join Us For Our Fall Potluck BBQ! Our summer potluck at Salter Grove was so enjoyable that we’re doing it again! Bring your favorite dish on Saturday, September 23rd, from 4 p.m. until sunset (rain date September 30th). There will be a grill for BBQ lovers. No one complained last time that we had as many desserts as savory dishes but posting your dish at goo.gl/YGJAsr will guarantee that every dish will be different! Friends of Salter Grove is participating in the International Coastal Cleanup, which is sponsored by Save the Bay. The date is Saturday, September 16th from 10:00 a.m. until 12:00 noon and we will be meeting in Salter Grove. To sign up click here. Thanks for Making Our First BBQ a Success! Long-time residents and more recent arrivals met to enjoy the first sunny afternoon in days at Salter Grove on July 15th. Face-painted children (courtesy of www.marcwkohler.com) romped nimbly over rock formations while adults played lawn games on the well-tended grass. Adults and children alike, quickly became addicted to making gigantic bubbles that undulated through the air. Tasty food was plentiful and there were almost as many desserts as savory dishes. A good time was had by all and some people even wondered if they had missed previous Friends of Salter Grove get-togethers. Both organizers and participants agreed that this potluck should not be the last. Stay tuned for the next one! Come celebrate Salter Grove and meet neighbors who appreciate our beautiful park as much as you do! Bring your favorite dish to a Potluck BBQ Picnic at Salter Grove on Saturday, July 15th, from 4 p.m. until sunset (rain date August 5th). Grills will be available for searing your meats and vegetables. Posting your dish at goo.gl/YGJAsr will guarantee the ultimate bayside smorgasbord! Activities will include face painting by Marc Kohler (also a Gaspee historian), frisbee, horseshoes, bocce, and a lucky draw. Feel free to bring bubble makers, beach balls, and organize games that you enjoy for outdoor fun with new friends. Don’t forget sunscreen, bug spray, and plenty of liquid refreshments for a comfortable stay. The Warwick Parks and Recreation Department will provide extra picnic tables for the occasion, but bring your lawn chairs and blankets so you can enjoy the park from any vantage point. If you’d like to enjoy the fun and help out at the same time, contact us at friendsofsaltersgrove@gmail.com or when you arrive.